The province of Samar is the largest of the three provinces in the Island of Samar with a total land area of of 559,100 hectares or 5,591 square kilometers. This constitutes 41.23 percent of the island’s total land area and 25.93 percent of the total land area of the whole Eastern Visayas region (see table below). Fifty nine percent (59.11%) or 330,500 hectares are in the mainland, while the remaining 40.89% covering 228,600 hectares are separate islands. The biggest mainland area is Calbayog City (90,300 has. ), followed with Basey (57,270 has. ), Gandara (43,280 has.) and Paranas (45,740 has.). The island towns are Almagro, Sto. Niño, Tagapul-an, Zumarraga and Daram has the combined area of 22,860 hectares. Land Use is the way in which an area of land is actually put to use. The province of Samar has a total area of 3,943.18 square kilometers of protection land and an area of 1,647.82 square kilometers of production land. The production land is comprised of 824.10 square kilometers of sustainable land, 822.51 square kilometers of under-used land, and 1.20 square kilometers of over-used land. One of the basic indications of land use potential is the natural land slope categorized into 6 ranges. The first category is 3 percent slope or flat lands constituting a total area of 73,314 hectares. The 8 percent slope is characterized as gently sloping to undulating and is also highly suitable for agriculture and non-agricultural development. This covers 28,529 hectares or 5.10 percent. About 12.32 percent or 68,869 hectares fall within the 8 percent and under 18 percent category. Hilly to mountainous areas, are categorically within the 18 percent to 30 percent slope, comprise a total area of 122,004 hectares or 21.82 percent. Slopes above 50 percent are characterized to be very steep and extremely rough mountainous areas, have a total area of 84,420 hectares or 15.07 percent (see table below). The natural land elevations of the province of Samar show that about 59.77 percent or 33,180 hectares are within 100 to 1,000 meters. Based on the climate and topography, the province is divided into five pedo-ecological zones. Warm–cool upland and hilly lands accounts for 55.16 percent (380,370 ha.) of the province’s total land area. Erosion is a critical environment phenomenon brought about by natural processes such as rainfall intensities, floods, earthquakes, surface water run-off, and man-made activities that are harsh on the environment such as illegal cutting of trees and shifting cultivation or kaingin system, the province of Samar is dominated by slight erosion covering a total land area of 262,402 hectares or 46.93 percent. 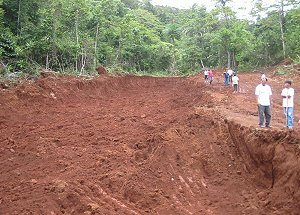 Severe erosion in the province covers a total land area of 129,721 hectares or 23.20 percent. Likewise, about 34.87 percent of the province’s total land area is degraded. Topographical and hydrological constraints impose limits to area in various parts of the province. Only 33,037 hectares or 5.91 percent of the total land area impose no land limitations. Watch movies and tv shows free. The province’s total land area of 559,100 hectares is legally classified into the following: the alienable and disposable land covering 348,789 hectares (62.38 percent), and 210,311 hectares (37.62 percent) of forest land. Samar has four (4) main groups of soils covering 553,088 hectares or 99 percent of the total land area of the province, namely: a) soils at the eastern portion of the province; b) soils at the central section; c) soils at the northwestern portion; and, d) soils in the southwestern portion. The first soil group constitute about 140,234.5 hectares or one fourth (1/4) of the total soil cover. Forests predominated once in this land area. Under this group, two soil types are found, namely: Louisiana clay loan and mountain soil which is the second largest soil type of the province, equivalent to 22 percent of the whole soil cover. The second group found in the central section of the province comprises about 112,098.5 hectares. This represents less than one fourth (1/4) of the total soil cover. The soil typed predominating in this area is clay loam. This partly covers forest areas. The third soul group which is the largest in area, constitutes about 234,092 hectares or 43.09 percent of the total soil cover. Under this group, the Catbalogan clay loam is agriculturally the most important soil type representing about 34 percent of the total area. The Tingib clay loam, Dolongan loamy sand, San Miguel clay loam, Biga-a clay loam and Hydrosol make up the rest of the province’s soil cover. Most of these are found on plains and along the valleys where most of the agricultural crops are grown. Approximately 62,663 hectares or 11.32 percent make up the fourth soil group. About 33,060 hectares are found in the municipalities of Villareal, Catbalogan and the island municipalities of Zumarraga and Daram. The rest are found in the southern tip of the province. The table below shows the municipalities of the province with the corresponding soil types. Dolongan loamy sand, Tingib clay loam, Catb.-Tingib complex, Hydrosol. Catbalogan clay loam, Faraon clay. Catbalogan clay loam, Faraon clay, Mountain soils, Hydrosol. Catbalogan clay loam, Faraon clay, Hydrosol. Tacloban clay loam, Mountain soils, Beach sand. Faraon clay, San Manuel loam, Mountain soils, Catbalogan clay loam. Catbalogan clay loam, Bigaa loam, Hydrosol. Ubay clay loam, Bay clay loam. Catbalogan clay loam, Tingib clay loam, Hydrosol. Catbalogan clay loam, Bigaa loam, San Manuel clay loam, Faraon clay. Mountain soils, Faraon clay, Palapag clay loam. Catbalogan clay loam, Bigaa loam, Silay loam, Hydrosol. Tacloban clay loam, Ubay clay loam. The province has five (5) major rivers: Basey River, Calbiga River, Ulot River, Gandara River and the Oquendo Left/Right River. These rivers are utilized for irrigation and as transport ways by the populace that lives in the interior barangays of the municipalities. As a source of water supply, the spring waters from underground sources flowing through rock formations supply the rivers and creeks throughout the province. Some springs are tapped to provide potable water to several municipalities and the excess water flow to the rivers. The province has also several waterfalls (especially in Calbayog City) for tourism and hydro-energy development. In terms of coastal and marine resources, the province has a relatively long coastline, which extends over 300 kilometers from Calbayog City in the north down to the southernmost municipality of Marabut. There are six (6) major fishing grounds with a combined area of about 298 square kilometers considered with production potentials: Samar Sea, Maqueda Bay, Villareal Bay, Zumarraga Channel, San Juanico Strait, and, San Pedro and San Pablo Bay. These fishery areas, likewise, has large areas suitable for brackish water fishponds development. Samar has a total forest area of 167,300 hectares; 10,524 of watershed reserved and an area of 116,402 hectares of established timberland. It has also an area of 1,163 hectares of reforestation. The province’s remaining forest cover a total area of 167,300 hectares, dominated by second growth forest (75.85%). Old growth forest accounts for only 13.63 percent of the total area. Hematite and magnetite chromate, nickel and manganese are the major ore commodities of Samar. Copper, minor zinc and lead are usually in the primary form of sulfide and associated with abundant pyrite. A mining site for Bauxite deposits in Brgy. Canliges, Paranas, Samar. The province has a 50-year moratorium on large-scale mining activities. Part of the municipalities of Paranas, Hinabangan, San Jose de Buan and Brgy. Calapi, Motiong are to be found the mineral deposits of copper, manganese and bauxite. A wider copper prospect location covering an area of approximately 600 square kilometers is situated at Bry. Lawa-an, Paranas, Samar, about 30 kilometers southeast of Catbalogan. Two area surveyed for manganese deposits are Brgy. Maylobe in Paranas and Cataydongan in San Jose de Buan, which cover an area of about 67 square kilometers. The Cataydongan deposit is similar to that of Maylobe, however, the host is different being pyroclastic and volcanic rocks. Limestone widely outcrops in Samar. In some areas, massive coralline limestone suitable as “marble” for construction and indoor decorations are exposed for quarrying and processing, which do not require sophisticated equipment. The fossil dry caves are the natural habitat of bat colonies and other animals. The accumulation of the birds and bat excrement together with bones over long periods of time gave the origin to guano; phosphate-rich deposits that are often suitable for fertilizer. The province has potential areas for mining which are classified into metallic and non-metallic minerals. These minerals are listed and classified on the table below. 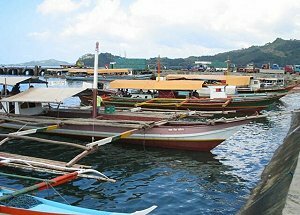 Commercial fishing is a major activity in Samar. The province is a major supplier of fish products to Manila. 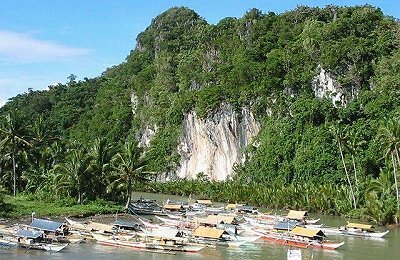 The province had a relatively long coastline in the western side extending over 300 kilometers from Calbayog City to the Southermost Municipality of Marabut, of which fishing became its major activity. The bodies of water providing fishing grounds totaled to an area of 298 square kilometers. It consists of the San Pedro Bay (2km2. ), Maqueda Bay (92km2. ), Samar Sea (198km2. ), Zumarraga Channel (2km2. ), and the Villareal Channel (4km2.). In the table below, fish production as of 2004 grew by 3.15% compared in 2003. Municipal fishing garnered the biggest share at 18,285 metric tons or 70% of the total production, followed with commercial fishing, 29.75% or 7,770 metric tons. Also increased in fish production was the inland fishing, which was doubled (100%) from its 2003 total fish catch.